Sorry to my regular readers for not posting for some time. Unfortunately when Animation 4 Business is good I don't get all the time I need to post regularly here. I've also been struggling with the latest iClone 5 Quick Fix Tutorial, Rigid Body Physics, which should have been simple but ended up with me seeking help on Reallusion's Forums. If you're interested in iClone and was wondering how hard it is to learn then that's what this series is about, my experience of learning iClone 5 using Reallusion's Quick Fix Video Tutorials. Click the following links for Part 1, Part 2 and Part 3. If you're just looking to learn iClone then skip this and try the tutorials for yourself as this series is not a how to guide for iClone 5. 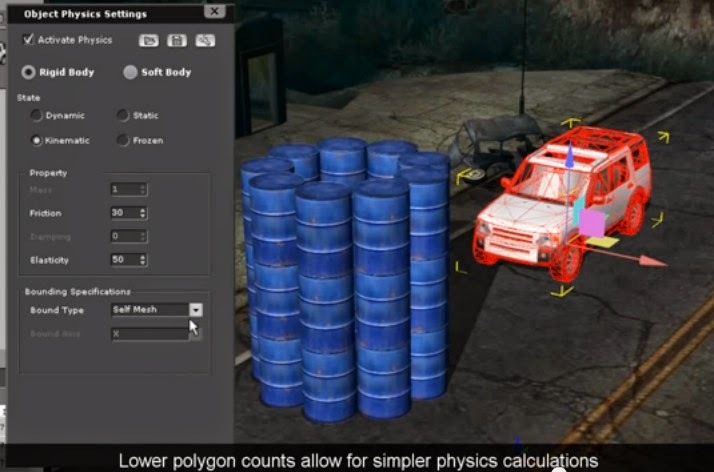 The Rigid Body Physics tutorial demonstrates how to construct a simple car crash into a stack of barrels. Everything is set to the default settings so it's mostly a case of just dragging the relevant barrel props onto the stage and then setting up the jeep iprop to crash through them... except, in my case it wasn't. This 3 and a half minute tutorial was meant to be simple...what? So, setting up the barrels (which are already saved as physics props with predefined settings) was straight forward enough. As was setting up the jeep and putting in place a prop that's known as the infinite plane. To explain the infinite plane it's essentially an area that you define that acts as a barrier that props with physics properties can't penetrate. A typical example, and in the case of this tutorial, is the ground. Without the infinite plane defined those barrels drop through the ground into an infinite hole. Trouble is, when I put my barrels on the infinite plane they didn't sit still. They kind of jiggled around... a lot. In fact it moved them around so much that my barrel stack fell down. I played around with quite a few physics settings but in the end went to the Reallusion iClone forum to find answers. One forum suggestion was that the World Scale was set too high. I'm not too sure what that setting represents but the lower the number the less pronounced physics simulations are. For example on the lowest setting it had the effect of making everything move in slow motion. Lowering the world scale did fix my barrels but not other physics props I experimented with. Take a look at the video below where I have barrels set up and, in the distance, cardboard boxes and wooden crates further down the road. Notice the barrels are still but the boxes and crates are moving around despite not being touched by anything. The next forum suggestion was to set the barrel's physics profile to frozen rather than dynamic. Personally I don't quite understand the different profiles, there are four in total. The other two are kinematic and static. I was advised on the forum that dynamic physic props are more sensitive to other physics props within their proximity whilst frozen physics props only react when something actually bumps into them. In any case, changing the barrels profile to frozen seemed to do the trick and worked with my boxes and crates too. See the video below. I also set the World Scale back to its original setting. I got a good tip on the forum that rendering your video on the By Frame setting instead of Realtime gives better results with physics simulations. Which appeared to be true as fewer of my barrels, boxes and creates seemed to drop below ground level with this setting adjustment. Honestly, I expected to breeze through this tutorial but the default settings of my physics props didn't act like those in the tutorial. I still don't really know why? I've followed the tutorial step for step several times, creating the exact scene in that video but not getting the same results as those of the video. The next tutorial deals with Soft Body Physics. I haven't even looked at it yet but I hope it proves to be a little less baffling.